car2go parking is available at Park2Go Value Valet, located next to the Calgary International Airport. In addition to your trip cost, it’s just $12.50 (plus tax) for any trips ending at or and leaving from Park2Go and Hampton Inn by Hilton Calgary Airport North. It costs just an additional $12.50 (plus tax) for trips to and from Park2Go and Hampton Inn by Hilton Calgary Airport North. Enter the lot at 2121 100 Avenue NE, Calgary, Alberta, T3J 3N5. Proceed through the gate and follow the car2go parking signs to your right, where the designated parking stalls are located. End your trip in one of the designated car2go stalls located next to the Park2Go Value Valet building. Note that only one car per stall is permitted. Proceed to the Park2Go 24/7 shuttle located across from the car2go parking spots. The shuttle leaves as soon as it has passengers and will take you to the airport in less than 9 minutes. The cost of the shuttle is included in your drop off fee. 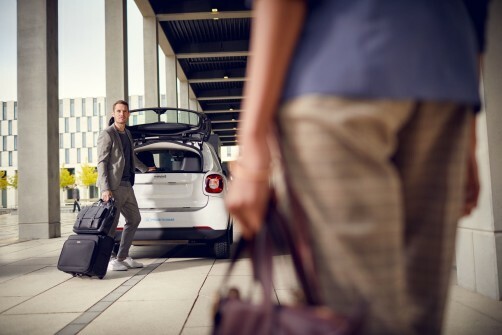 Reserve a car2go after your plane lands via the car2go app. Please note you will have 30 minutes to get to the vehicle. Exit through the "Meeting Place B" doors on the arrivals level and proceed to Post 24 to meet the Park2Go shuttle. If there is no Park2Go greeter at Post 24, please call 403-532-4844 to request one. Service is available 24/7. When asked for your return slip, just let the driver know you're picking up a car2go. The shuttle will drop you off outside the Park2Go Value Valet office where you’ll find your car2go. Return to the Home Area and end your trip at your final destination. Welcome home!